Facing the defending Olympic gold medalist in his home pool, Vyatachanin produced what is likely his best swim of the year so far, dropping a crazy 1:55.33 to not just win but blow away the Grand Prix field. Vanderpool-Wallace has been developing her butterfly and the backend of her 100m freestyle under the magic of David Marsh at SwimMAC. With just one stop left on the Arena Grand Prix Series, the women’s points race has all but wrapped up after another dominating Katinka Hosszu weekend, while the men’s battle is just starting to heat up. 53.86 in-season 100m backstroke is no joke. Plummer’s well ahead of his own gameplan to swim fast at Pan Pac Trials. Josh Schneider stepped up to win the 50 freestyle, swimming a 22.17, which ties him for 19th in the world this year. Andrew Seliskar is the one to watch today! He had his first Grand Prix victory yesterday in the 200 butterfly and will be chasing his second in the 200 IM. Michael Phelps took the second seed in the 100 fly on Friday morning, and will be fresher at night after scratching the 200 free, where he finished 8th. 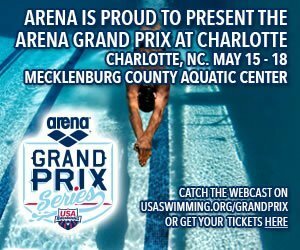 The Charlotte stop of the Arena Grand Prix Circuit is still packed to the brim with big names, including Michael Phelps making the second appearance of his comeback tour. Jones is training harder than ever in the middle of an Olympic quad, using Mare Nostrum to find his nitro. After Seliskar’s 4:19 in the 400 IM and 1:57 in the 200 fly, exceptional in-season times, he’s a swimmer to watch as we near the 2016 US Olympic Trials. Arkady Vyatchanin, racing against the defending Olympic Champion, had the swim of the night in the men’s 200 backstroke final. Katinka Hosszu is the top qualifier in three different events on day 3 of the 2014 Charlotte Grand Prix. Katinka Hosszu is the top seed in the 200 butterfly and the 100 backstroke at the 2014 Charlotte Grand Prix. She won the 200 freestyle and 400 IM last night during finals.